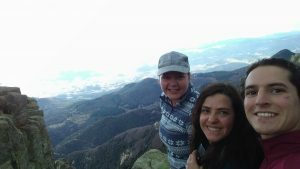 As I promised in last week´s post on 5 day hikes in Catalonia, I am working on documenting my hiking experience to prepare for becoming a tour guide in the Canadian Rockies. 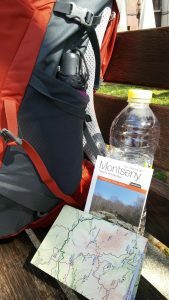 On Sunday I set out for the biosphere reserve, Parc Natural de Montseny. That was easy. 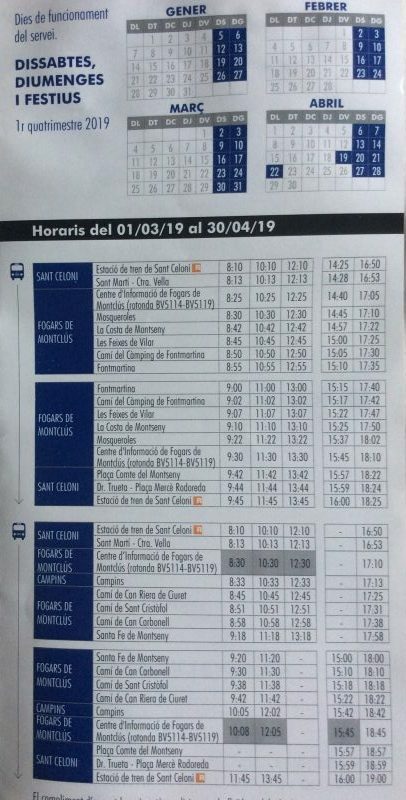 There is a train every hour from Barcelona to Sant Celoni that takes around an hour. From Sant Celoni there is are buses that go to different areas in the park. The bus stop is right outside the Sant Celoni train station. But check on times before you go. I had to wait an hour for the bus. Then again, that gave me time to have a sandwich in the town center, walk around a bit and get maps for the hike in the tourist information. The bus will take you to the park´s welcome center. 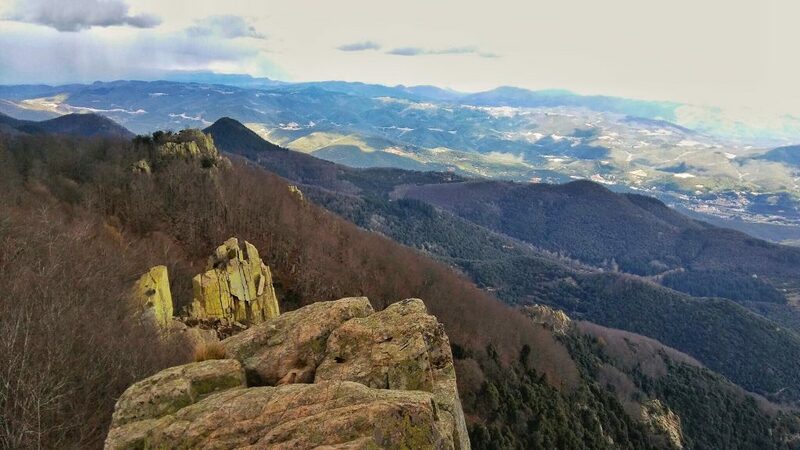 From there you can either stay on it and go to Fontmartina or change to another bus that takes you to Santa Fe de Montseny. The bus rides takes around an hour. Since I asked for a longer hike with some significant elevation gain, the information recommended the Empedrat de Morou trail. It starts from the Santa Fe welcome point – if you didn´t get a map in Sant Celoni, you can get one here. On the bus I met a lovely couple from Uruguay, Sofia and Martin, who ended up taking the same trail as I did. I can´t say we needed the map, but better safe than sorry. The trail is well marked with orange squares. Between the three of us we always saw the signs and never got lost along the way. The trail is 5.7km long and takes 1h45min. Or you can take a variation to the tower Turo de Morou of 6km that will take 1h50min in total. We opted for the slightly longer version with an elevation gain of roughly 230m. The trail takes you past a church, to the tower where you have a panoramic view of the area. Then down towards the empedrat de Morou which is a rock terrace shaped by erosion. The view from here is also stunning. Then it goes on to a lakes called Pantano de Santa Fe before the circle is complete. Towards the end there are some small waterfalls and cute little bridges over creeks. True to the nature of mountain terrain, we experienced 3 seasons in a day. It was sunny in the morning, until we were about 1h into the hike. Then suddenly we were hit by a hail shower. After the hail we found ourselves in the middle of thunderstorm with full-on rain. That is how we finished the trail – rainwater soaking up the hems of our pants. We barely made it onto the bus before the hail covered the ground in a white layer of ice. I should probably write a full on packing list in a separate post, because I was so grateful for every single item I brought. In my day pack I had a large bottle of water and food. When my college friend taught me the hiking basics in the Swiss Alps 10 years ago, she said to ALWAYS bring food and water. I never regretted it. All in all I can say, this probably was the best preparation hike I could have done for the Canadian Rockies. Have you ever gotten into real bad weather during a hike? Tell me about it in the comments below!